Metamucil is a bulk-producing laxative and fibre supplement. The Metamucil brand has existed since 1934, and was owned by G. D. Searle & Company until 1985 when Procter & Gamble acquired the brand. The active ingredient is psyllium seed husks. It may also reduce cholesterol when taken daily. Metamucil is sold in powdered drink mixes, capsules, and wafers. 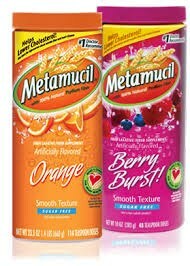 Metamucil has been available in different flavours, such as Orange, Berry, and Pink Lemonade. A sugar-free version has also been available.